Your hair is your crowning glory, or is it? Do you spend a lot of time and effort on your hair only to find that it is dry, frizzy and damaged? This is often a result of overprocessing and too much heat styling. Perms, coloring, curling or straightening, and blow drying can all have a devastating effect on your hair. And even if you rarely do any of these things, summer sun, chlorine or cold winter weather can take it's toll, or your hair may just have a tendency toward dryness. 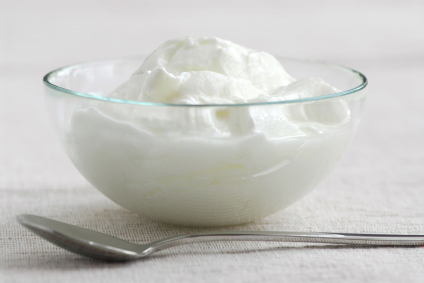 Apply plain, unflavored full fat yogurt or mayonnaise on your hair. Leave it on for half an hour, rinse thoroughly, shampoo and condition. Beat up two or three eggs, and add 2 tablespoons of original grapeseed oil and a teaspoon of vinegar. Apply it to your hair before shampooing, cover it with a shower cap, and leave it on for a half hour. Rinse throughly with cool water. Shampoo and condition as usual. Mash up a brown banana with a over ripe avocado to make an effective and great-smelling hair mask. Apply it to your hair and let it set for up to an hour, then rinse it out with warm water. Mix equal parts coconut oil and lavender oil, warm it up a bit, and massage it on your scalp and into your hair. Cover, leave it on overnight, and shampoo in the morning. Grapeseed oil also works well for this purpose. Mayonnaise mixed with eight mashed strawberries will condition your hair when massaged into clean, damp hair. After you have the mask on your hair, use a shower cap or plastic wrap to cover your hair followed by a warm towel. Leave this on your hair for at least 15 to 20 minutes and then wash it out when you shampoo and condition your hair. Mash an avocado up and mix it with one tablespoon grapeseed oil and one teaspoon of baking powder. Apply to your hair, leave on your hair for at least 15 to 20 minutes before you rinse it out. Treating your dry hair doesn't have to be done in a high priced salon. You can find everything you need to do it yourself in the grocery store, or even in our kitchen. These natural treatments will banish the frizzies and leave your hair soft, smooth, and manageable. Minimize exposure to heat and chemicals. Let your hair air dry, consider styling with foam rollers instead of a curling iron, and space chemical treatments several weeks apart. Massage your scalp gently with your fingertips. This stimulates the scalp's oil glands, increasing natural oil production. Doing this each time you shampoo will make it easier to remember. Make sure you're getting enough essential fatty acids in your diet. These are crucial to the body's oil production, and not getting enough of them can result in dry hair even if you do not use heat or chemicals in styling. Foods that contain essential fatty acids include nuts, seeds, and certain types of fish. Increasing your vitamin E intake can also produce shiny hair. Switch to a natural shampoo like Watkins to gently clean your hair. As an added bonus, you'll probably find your hair color will last longer too. Finish off with a natural conditer that won't weigh down your hair. Like these tips? Why not Share this page with your friends! Break egg into glass bowl. Pour olive oil in egg shell measure then add to egg. Blend well. Grate peeled cucumber into mixture and blend well making sure cucumber is mashed and mixed in well. Blend into hair beginning at the roots and working to the ends until hair is completely covered. Allow to stay in hair for ten to fifteen minutes. Rinse hair thoroughly with warm water to remove. Best if treatment is used once a month all year long. Where Can You Get Watkins Products? You can shop for Watkins natural hair care products and grapeseed oil in our safe, secure Watkins store or request your free Watkins full product catalog and order by mail or phone.